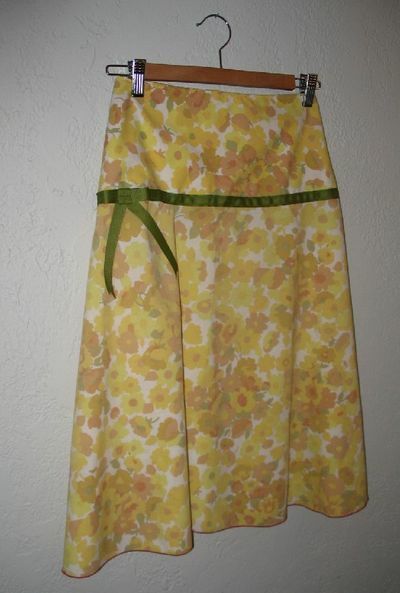 I was able to do some non-quilt type sewing. I got a bit to excited by the sun, and was inspired by this from Tania, so I made this skirt (same fabric as this) but now it's rainy and cold. This is fun a $3 vintage sheet-great deal. I'm going to make a dress for Sadie out of the rest, and there's even more left-but can I say, once again, how I hate sewing with blends? I really do. Thank god I have a serger and did a rolled hem (in hot pink) so I wouldn't have to deal with trying to press that edge. and I can't believe I had to bring the high chair up again for Delia. It's seems like she was just born-and now she is eating! I made this cushion (a total rip-off of Erin's cute one for Lilly's chair) and the non-detail- long distance-shot is to spare everyone from seeing just how really dirty this highchair is and to show one of my paintings, "friendly squid". 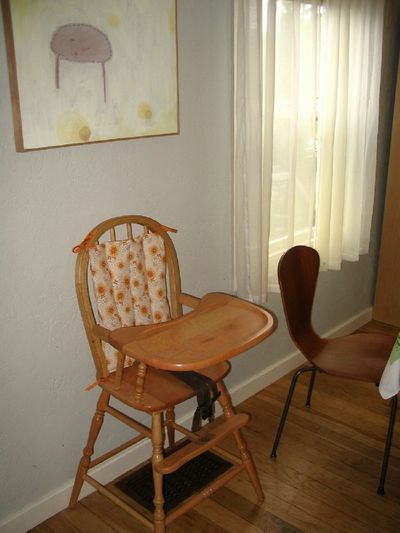 Love the wooden highchairs, but if you leave anything on there-it's like cement-I have to scrape it with a pallet knife.